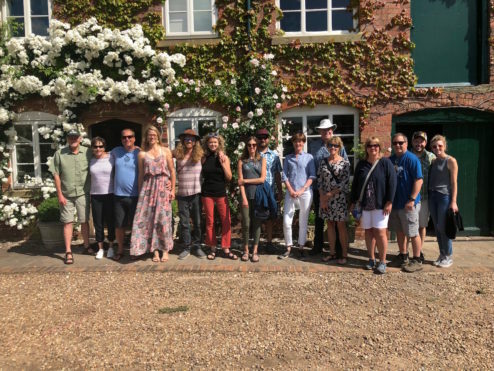 We were delighted to host 16 members of The Odell Brewing Company this week from the town of Fort Collins, Colorado, USA. Every other year, Odell’s reward members of staff who have worked at the brewery for 5 years with a trip to the UK. They joined us for a tour of the apple orchards and hop yards, concluding with the infamous Bruff hop picking machine. We started the beautiful sunny summer morning with a glass of delicious homemade apple juice, made from Stocks farms’ homegrown apples and even got to sample a range of different beers from ‘The Hop Shed’ brewery. Ali spoke about the different apples and hops from planting right through to harvesting and distribution. The weather was kind enough to let us fully appreciate the privilege of farming on the Herefordshire/ Worcestershire border, an area of outstanding natural beauty, a lovely contrast to Fort Collins. Doug Odell and the team have visited Stocks Farm a number of times over the years – it’s always great to see them and enjoy their beers.